A normal shampoo bowl is an object which is sterilized to permits incapacitated persons or normal human beings to shampoo their hair while lying down on the chair. This tool might be used in homes, hospitals, salons, etc. However, if you get a shampoo bowl along with a cabinet, then it can be quite useful to you. How Shampoo Bowl with Cabinet Works? There is a motor-powered electric heater which heats up the water in the single tank. Then, the water is pushed up to a shower outlet by means of a flexible pipe. All this is controlled by a regulator on the sprayer along with hot as well as cold water taps. After this, the excess water will be accumulated in the sink drainage system through a pipe. Then, the water is placed into an excess/drainage gathering chamber which is disposed below the basin later. The two sideways doors of the shampoo bowl allow the entrance to the tanks, electric heater, and the water pump. The sides of the shampoo bowl with cabinet also possess shelves for the placement of additional beauty salon accessories like shampoo, hair dryer, massage oil, etc. 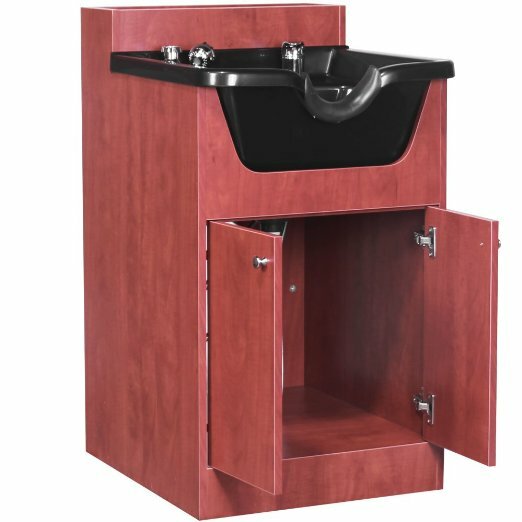 ​This specialized salon shampoo bowl has a self-supporting cabinet which shows its functionality as well as luxury. It offers a complete satisfaction to the client and the user in the salon. 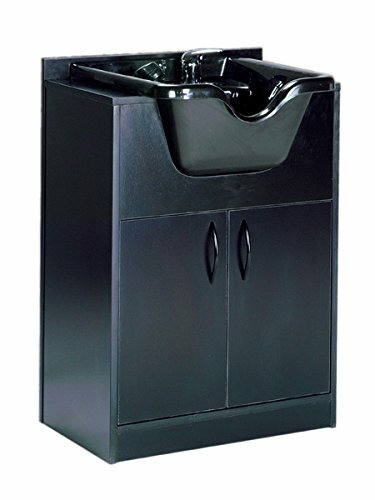 Usually, the shampoo bowl with the cabinet comprises of a heavy duty acrylic bowl (used for shampooing the hair) along with the free standing cabinet made up of steel or wooden. An Acrylic is a material which is used in a maximum number of products in numerous industries. Actually, it is a mixture of unbelievable strength and artistic beauty. There is a proper storing space for keeping all the vital things which are required in the beauty salon. The steel cabinet or the wooden cabinet of the product is modified particularly for its shampoo bowl. It offers complete storage for consolidating all the essential hair goods, for example, bottles of shampoos, hair conditioner bottles, containers of hot oil and also a separate place for keeping extra hand towels. 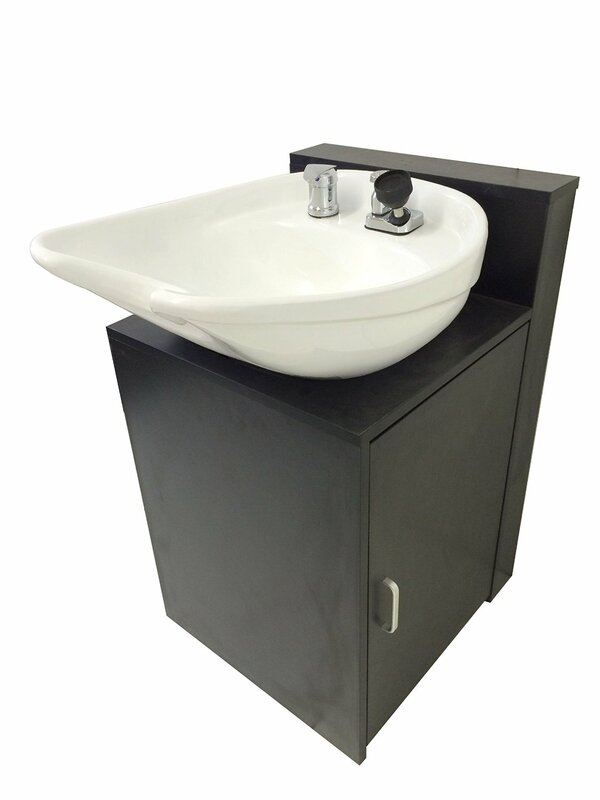 The shampoo bowl with cabinet is also furnished with all the important hardware, gears, shower pipe and the left-over hair bin. The shampoo bowl with the cabinet appears to be more professional owing to its impeccably concealed drainage system and the precise enclosure underneath the basin. There is an easy to specialized grade hair trap in the product. It benefits in a safety against any jewelry loss during hair washing, fall out of contact lenses or any other valuable things which may be unintentionally washed away in the drainage system. ​Since the shampoo bowl with cabinet is made up of huge sculpted acrylic; it makes them stronger and power resistant. Consequently, it is quite harmless to use. ​The next benefit is that as these bowls are built up of an acrylic material, it makes them lighter in weight. So, the user can move it from one place to another very easily. ​The shampoo bowl with cabinets already originates with all the essential parts (like hardware, fittings, spring tube) so there is no requirement to buy these parts distinctly. ​The forward-facing cabinets and additional storing capacity permit sufficient space for keeping all the beauty goods as well as the hand towels. ​These types of shampoo bowls are a complete package with a reasonable price that can match up the pockets of the buyer easily. ​The sitting chairs that are required for the shampoo bowl and cabinet are vented separately. Therefore, the user has to spend extra money in buying the chairs which are also an additional expenditure. ​The shampoo bowl’s size is also small in size which sometimes does not meet the requirements of the people. A Shampoo bowl with cabinet is a highly recommendable product which can easily fulfill all the requirements of a beauty salon owner or even of a household owner. The overall look of these shampoo bowls is also quite attractive as it comes in numerous designs and material. If someone has a space issue at their homes or salons, then this is the best product to buy. It can be kept adjacent to the wall for proper support which also gives a chance for the better interior planning of the place.